Shoulder bursitis is a painful swelling and inflammation of a bursa located in the shoulder. Bursae (plural of bursa) are thin, fluid-filled pouches that function as a ‘cushion’ between bone and soft tissue structures such as ligaments, tendons, skin or muscle. The fluid in the bursae is known as synovial fluid, which provides lubrication to reduce friction between structures. Bursae are located all around the body, particularly around the joints, and play an important role in facilitating pain-free movement. Bursitis refers to an enlargement of the bursa. When bursitis occurs, the bursa becomes inflamed with an excess of synovial fluid. The now enlarged bursa can be compressed against the bone or soft tissue structures, and any movement that causes friction on the bursa can produce pain. 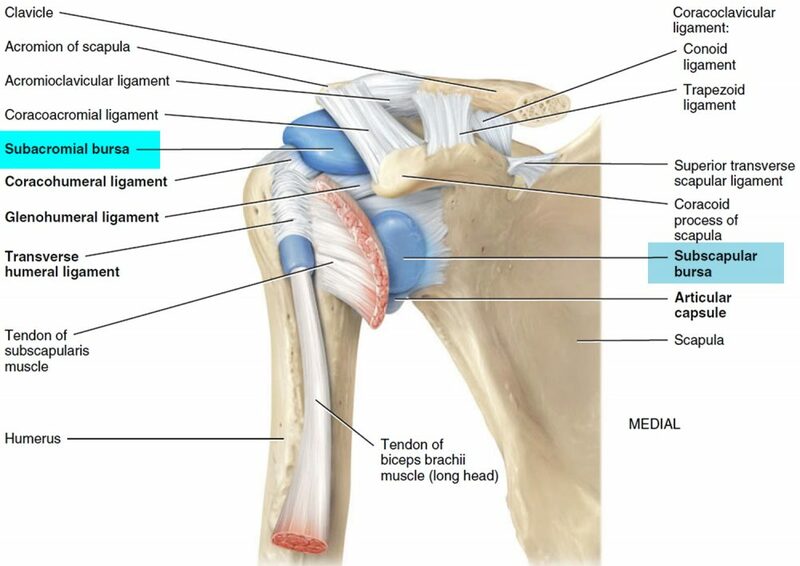 The shoulder has various bursae highlighted above, with Subacromial Bursitis being the most common form of bursitis. Bursitis is a secondary symptom caused by many factors. Bursitis can be aseptic or septic: if bursitis is caused by bacterial infection, then it is classified as septic. Your Physiotherapist will perform a series of special tests to determine the presence of shoulder bursitis. 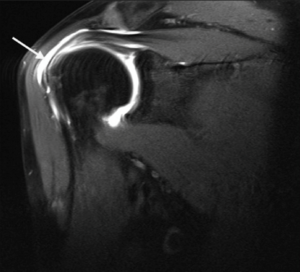 An MRI or X-ray may be recommended to confirm the diagnosis of bursitis or to identify other pathologies, as shoulder bursitis often coexists with shoulder impingement. Various treatment modalities can be adopted by your Physiotherapist to best suit your needs. Depending on the severity of bursitis, your doctor may also recommend corticosteroid injection into the area to relieve inflammation and pain. 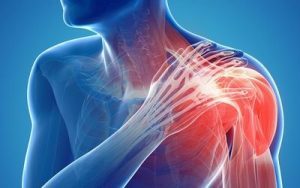 Below is a list of forms of treatment that best address the symptoms of shoulder bursitis. In summary, shoulder bursitis is a condition which can detrimentally affect daily living. It is paramount to take care of our shoulders and to recognise the importance of our bursae in producing pain-free movement. If you have any further questions or want to book an appointment, don’t hesitate and get in touch!